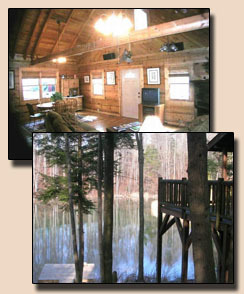 Natural Bridge Cabin Rental - A gorgeous Blue Ridge Kentucky mountain log cabin for rent. Hill Billy Cabin is a rental cabin located in the Natural Bridge / Red River Gorge area of Eastern Kentucky Mountains, just one hour from Lexington, Kentucky. This beautifully decorated log cabin is located in a secluded, private area of Cliffview Resorts. It is surrounded by trees and sits on a 25 ft. deep 1.5 acre spring fed lake that has clear water. The lake has a floating dock for swimming & sunning and provides very good fishing. There is a 1.5 hour hiking trail just down the road. This rental cabin is excellent for family vacations or a private getaway with your special partner. Hill Billy Cabin is a true log cabin built in 2000. It has central air & heat. The floors are hardwood and ceramic tile. There are two queen size bedrooms and a sleeping loft with twin beds. The master is downstairs along with a full bath with a two person Jacuzzi tub. There is another full bath upstairs in addition to the bedroom & loft. The living & dining areas are open to the kitchen. There is a gas fireplace for the cold nights. An antique Hoosier cabinet serves as the bar with cocktail, wine & champagne glasses, complete with a shaker for martinis. The queen beds have Egyptian cotton linens and the bathrooms have Ralph Lauren towels. And to top it off, nice art work hangs throughout the cabin. There is a 10 X 25 foot covered porch with porch swings and a rattan sofa overlooking the lake. The fish can be seen swimming in the lake from your porch view. You have your choice of a gas grill or charcoal grill. A fire pit is down by the lake. There is a no-pet and no-smoking policy.